Now that I have unfortunately installed 1password 7, how do I return to 1password 6 and restore my existing passwords including multiple vaults? First of all, 1PW7 does NOT require a subscription, it can be bought with a licence. However, 1PW7 from the App Store is subscription only, if you want a licence you will have to get it direct from AgileBits. Also 1PW7 requires a new licence. There are advantages in a subscription, see https://support.1password.com/why-account/ for some information. And for a security app such as 1PW it is defiiintely best to have the latest version, whether by sub or a licence. If you insist on staying with 1PW6 you can do. Close 1PW7 completely (ctrl-option-cmd-Q, not just cmd-Q) and trash it. The installation of 1PW7 should have left you with a zipped version of 1PW6. Just unzip it and you should be back to where you were. Welcome to the forum, @wernetwr! I'm sorry for the confusion. 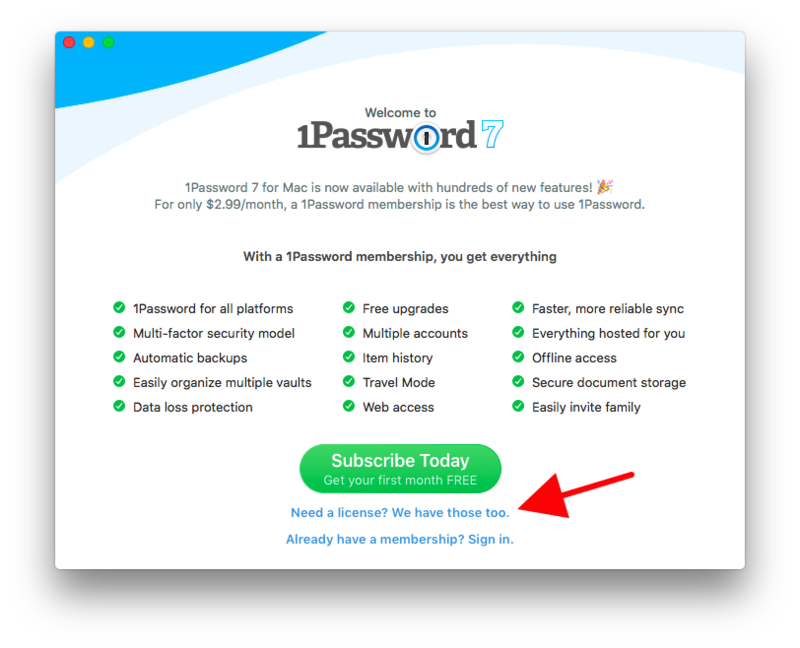 1Password 7 for Mac does not, as I see @danco has already mentioned, require a subscription. To be clear, all 1Password memberships (subscriptions) allow you to have as many vaults as you wish, so that's not an issue. But if you prefer a standalone license for 1Password 7 for Mac, make sure you have the copy of 1Password 7 for Mac downloaded from us (not the Mac App Store), and you'll be able to purchase a standalone license. Hope that helps! I am running 1Password 6 on MacOS and iOS. I deleted 1Password from my iPad running iOS 12 to reset my password vaults, as per the instructions. Apparently there is no way to just delete a vault individually. When I redownloaded the iOS from the App Store, 1Password 7 downloaded. I have a paid license for both MacOS and iOS versions and am not ready to upgrade, yet. How can I get 1Password 6 for iOS back on my iPad? I do have a copy of version 6 of the *.ipa file however since Apple removed apps from iTunes, I am unsure how to side load it to the device. @gkrodg00 - since 1Password 7 for iOS is not a paid upgrade, and it will work and sync just fine with Macs using version 6, I'm not sure why you would want to revert to the previous version. What am I missing? Apologies, this was my fail. When I reinstalled I failed to realize I could scroll down the Welcome splash screen in the iOS version. All I saw was the Free Trial, login with 1Password.com etc. I looked at it again after your message and realized the splash screen scrolled and found where I could import from PIF that I loaded in iTunes. All is as it was. The WLAN server is finicky, has been for years. Sometimes it sees my iMac, sometimes it does not. Have not been able to troubleshoot. The main reason I was restoring my vault. Did all the usual, same wifi SSID, open and unlock 1P on iMac. I suspect it is a local network issue. iPhone more reliable than iPad but both do not reliably sync. Hit or miss. Can you post the link to where I can purchase the 1password 7 license direct from Agile? I downloaded 1P7 direct from Agile but do not see where on the site to buy the license. Do I purchase that from within 1P7 after I install it? Was reluctant to install and overwrite my 1P6 install but maybe its like prior versions and installs alongside the old version? @gkrodg00 - no worries! Glad to hear it you have it mostly sorted out. Do I purchase that from within 1P7 after I install it? Choose the indicated license purchase option, if that's what you want. Or, you can subscribe to a 1password.com membership by clicking the large green button above that. Since you brought up issues with WLAN syncing, I'd especially consider a 1Password membership, as it's by far the most stable and least “finicky" way to use 1Password today. Indeed, for the first time ever, 1Password 7 for Mac is a fully-sandboxed app, which means that even the version downloaded directly from our website (as opposed to the Mac App Store) is sandboxed. This means (among other things) that the data is stored in a different place in your Library folder in your user account on your Mac. So, when you make the transition, your older data from 1Password 6 for Mac remains in place, should you ever need it. You shouldn't...but it is there if you did for some reason. With the membership....can I opt-out and keep my data out of the cloud, off Agile servers and completely on my local machine? This part I am confused about no matter how many times I read the features. I will sacrifice device syncing convenience for total control of my data. I attempted to purchase after the install and both my credit card and amazon pay failed and now awaiting email back from customer support. Yes, you can work entirely locally. You will have to use the Primary vault and not the Personal one. And you will have to manage any syncing yourself. @gkrodg00 - that's the main difference between standalone and 1password.com membership: local data and advanced (manual) syncing. If you want that, you'll need to go the standalone license route, not the 1password.com membership. I have a laptop and a couple of servers. This number changes all the time. They all have multiple login users. I also have a couple of iPhones and a couple of iPads and a watch or two. How many computers can I put the App Store single user version on? How many computers can I put the App Store family version on? How many computers can I put the Stand alone version on? How many vaults can I create for each? Can the stand alone use both membership and iCloud? Can the App Store versions use both membership and iCloud? Also, it would be nice if I could compare pricing models for each at the same time. Welcome to the forum, @Designr! I'm not sure where you've been asking, but since this is the first discussion you've created here, it's the first time I've seen your questions. I'm sorry for the delay. I'm going to assume you're referring to version 7 of 1Password for Mac since that is the current version. You can install the version of 1Password 7 for Mac downloaded from our downloads page on as many Macs as you like. Standalone licenses are sold per-person and per-platform, meaning you'd need a license for each person that wants to use 1Password, but a single license can be used by its purchaser to license 1Password on as many Macs as (s)he owns/uses. The Mac App Store version of 1Password 7 for Mac is subscription-only, which means there is no cost to download it, but also means you are not able to use it in standalone mode. Anyone can download it without charge, but only 1password.com members can use it. Creation of vaults is unlimited, unless you are a member of a 1Password Families or 1Password Teams/Business account and you do not have vault creation privileges. I do not know what "stand alone on iCloud" or "on your cloud server" means. iCloud is one of our third-party advanced sync methods for standalone data. There is no "standalone version" versus "membership version" of the 1Password app itself; those are two different ways to store and sync your data (and also to pay for 1Password). Both standalone users and 1password.com members use the same 1Password 7 for Mac app. The version from us can be used as standalone or with a 1password.com membership. 1Password for Mac from the Mac App Store can only be used with a 1password.com membership. A standalone license for 1Password 7 for Mac is currently $49.99 during the launch special pricing period. Regular price will be $64.99. I do not know when the price will go up to regular price. Information about 1password.com membership pricing can be found on our 1Password membership pricing page. Hope that helps!